Rated PG for action, peril and brief language. There was something about "Pete's Dragon," a quality I couldn't identify at first, something that made it feel different from almost every other big summer movie, and its presence was so subtle that it took a while to figure out what it was: silence. The silence of the forest. 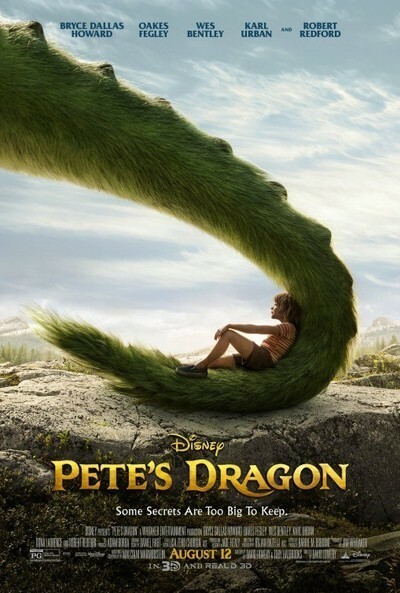 "Pete's Dragon" is David Lowery's remake of the 1977 Walt Disney animated musical about a boy and his best friend: a dragon who can turn invisible. It is the second gentlest kids' film of this summer, after Steven Spielberg's "The BFG. "—another film pitched at kids aged seven to ten (and adults who can still remember what it felt like to be that age), but one that failed at the box office, even though it touched some of the same emotional chords as Spielberg's masterpiece, "E.T." Lowery's film owes quite a bit to Spielberg generally, and "E.T" in particular (the dragon is named Elliott, the name of the hero of "E.T. "; there's a Keys-type adult character who's on the side of the kids, and the more brash and excited parts of Daniel Hart's score channel John Williams). There are nods to Spielberg-inflected movies as well, including "The Iron Giant" (another boy-and-his-creature flick, set in the forest primeval). But it might ultimately have more in common with movies by Terrence Malick, a Transcendental hippie Christian poet who isn't afraid to put the plot on hold and wander around with a camera, letting us experience a rarefied vision of the natural world. The whirring insects, the owls hooting in the treetops. The plot? Oh, right. There isn't much, and maybe it's a good thing that there isn't more, because the film runs an hour and 42 minutes and feels just a bit longer, like a goodhearted bedtime story that outlasts the kids it's meant to enthrall. Young Pete (Levi Alexander) is in the backseat of a car during a family vacation to the Pacific Northwest, reading his favorite book, "Elliott Gets Lost"; his parents swerve to avoid hitting a deer and die in an accident. When wolves menace the terrified child, Elliott appears like a guardian angel, saves him, and parents him. The kid is feral, rough around the edges, but he's sweet and considerate, because he had a good role model. Then comes a stretch that plays like desert island sequence of "The Black Stallion" where the only two characters are a boy and his horse. It's five years later, though perhaps not in the present; the movie is vague about its time frame, but the lack of modern tech suggests it's set before the '90s. Pete and Elliott are getting along like missing characters from "The Jungle Book." They play together in ways that seem audacious and reckless to anyone who didn't grow up in the woods with a dragon as caregiver. In one memorable image, showcased in the trailer, the boy leaps off a cliff and the dragon sails upward to catch him; you can tell by their nonchalance that it's not the first time they've done this. There isn't too much to the film beyond that, except for restrained, on-point performances (by Redford and Howard especially), and this feels like such a deliberate choice, such a willful disregarding of current commercial formula, that you might feel elated by the lightness and innocence on display. This is one of those medium-sized (or medium-sized seeming) movies with a big heart and lots of family appeal—the kind of film that can make adults feel like kids without making them feel gullible or stupid, and that can entertain more attentive and patient children simply by putting a memorable world and memorable characters onscreen. Common wisdom says Hollywood doesn't make this kind of movie anymore. But it's not true. The studios make one of them every few months, and whether they're great or merely good, they give us respite from the clanking, bashing, burning and pouting that passes for fantasy now. We've seen at least three live-action films this year in a "Pete's Dragon" vein: "Midnight Special," "The BFG." and "The Jungle Book." They all deserved to be supported, but only one was. Hopefully "Pete's Dragon" will be another. It'd be a shame to think of this genre of movie vanishing from theaters in a haze, like Elliott turning invisible.